Poll: What Do You Think of the Super Smash Bros. for Wii U Tourney Mode? This week brought some exciting news for Super Smash Bros. fans, with both current-gen versions getting updated to version 1.1.0. That meant paid DLC in both versions, but on Wii U also delivered YouTube replay uploads and online Tourneys. We know how the Tourneys work and have been competing online, but there are question marks over whether it's the mode that fans truly wanted. Reaction online has been distinctly mixed - on the one hand we have a mode that has been in demand for some time, but the restrictions aren't all welcome. Knockout action is limited to regular tournaments, and these official contests are also the only place for competitive 1v1 action; such is the popularity of 1v1 For Glory Regular Tourneys that getting into one requires good luck and a fair bit of waiting, as only a handful of events run on 5-minute intervals. Custom Tourneys, on the other hand, are similar in structure to community tournaments in Mario Kart 8. Of course, complaints are often expressed more vocally online than quiet approval, so we want to know what you make of the Tourney mode in Super Smash Bros. for Wii U. Let us know in the polls and comments section below - are you happy with the new arrival, underwhelmed or downright angry? What's your favourite feature in the Super Smash Bros. Tourney Mode? What's your biggest complaint about Super Smash Bros. Tourneys? 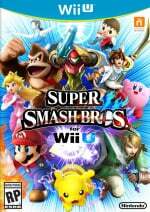 What do you think of the Super Smash Bros. Tourney Mode overall? My opinion is in the meh range, it just feels like it could have been better I'll use it now and then but local arranged tournaments are where it's at. I enjoy the regular ones, but I'm not as big of a fan of the custom tourneys. And I would have liked to see offline tourneys. One thing I'm hoping for in a future update would be something like doubles tourneys. The thing I was looking forward to, and I felt was a given, are local/offline tournaments. I simply don't get why they didn't include them, ESPECIALLY because Nintendo like to boast about how they embrace local multiplayer and everything. And that there's so little customization in the "customizable tournaments" is just as weird of a decision in my opinion. I'll probably use it from time to time, but I'm pretty let-down by how little there really is. The tourney mode is a pretty big let down and it's a shame. No local tournaments, The pre-made 1v1 tournaments are impossible to get into without waiting at least 30 minutes (and if you end up waiting only 30 minutes consider yourself lucky), and you cannot make your own 1v1 tournaments. You can't even make a team tournament. You can only make 4 player Free for all tournaments. That's not a good design choice at all. I've not even tried it but given that it's Nintendo I just have a feeling it will be lacking or feel gimped in some silly way—such is the case with a lot of this stuff when Nintendo decides to do it slightly different to everyone else just for the sake of being different. I havn't played it yet, but there's no local tourney, so I hate it. @Wolfgabe That's true, but Nintendo really should have done better at it before releasing it. @Wolfgabe they can but i doubt they will. nintendo isn't great at listening to their fans. Haven't played it, never really had interest in doing so, don't really intend to get around to doing so. @Wolfgabe Judging how NoA has been acting lately, they probably won't, plus Lord forbid someone complains about Nintendo. Glad I'm not alone in missing local. I don't care for it at all. All I want is a lobby mode with a ranking system like every other fighting game. I'll never understand how they can mess up a feature they got right before. The rulesets don't match the options of previous Smash games and not even the rulesets available for Smash 4 outside of tournaments, there are no local tournaments, and it has bad online support. Just what is that waste of time pretending to be? I was going to try it out with a full room (16 freakin' players coming together for this! ), and after several minutes of frantic "gimme the controller, I'll find it", we gave up on a (nonexistent) local tournament option and decided to start up Melee instead. Fun was had, and my friend (who owns this game) finally decided to sell this garbage. The only things of value he's gonna lose is the money for paid DLC content. It's handled pretty terribly and no local or amiibo tourneys is disappointing. Not to mention I can't even make a tourney because I'm console banned on my Wii U from Miiverse. Are custom matches too much to ask? It seems lacking tbh. No local tournaments is ridiculous. As it is now, I don't enjoy Tourney mode too much. I enjoy playing the Regular tourneys, but to join in on one of those you're forced to either wait for over half an hour if you want to participate in a For Glory tourney, that is if you're even lucky enough to catch one of those rooms empty. Then a lot of these rooms have Customs turned on too, and I really, REALLY don't like playing with Customs on. And there's no local Tourney mode either. Very lacking, if I have to be honest. I think the main problems are the lack of 1v1 tournaments outside of the regular ones Nintendo creates and considering "Customs" as both special moves and equipment. So just because I would only have fun, non-competitive tournaments with my friends I shouldn't get to have offline tournaments? It's a disappointment, but I'll still play. @Gridatttack Well, even Melee had offline tournaments. Why shouldnt this game have them? @MajinSoul Thats the question. I'm still puzzled why they didn't, considering the past 2 games had them. But I guess they didn't added them because almost no one used them, apart from the small, niche user base who actually used the mode. @Pete41608 would you actually USE the offline tourney mode? Offline tourney is just standard smash play with a coat of paint added to it. @MajinSoul I agree. If this was a feature in Brawl and Melee before it, there was no reason for tourneys not to be in Smash Wii U- really it should have been a Day 1 feature. I really hope that local tourneys come to Super Smash since I mostly play it with friends at home. I haven't tried yet, but... NO local tourneys?! That's unforgivable! I'll still participate in some tourneys, but it's definitely dissapointing. No local tourneys and no option for 1V1 tourneys is pretty stupid. @Wolfgabe If NoA barely listen to us then that means they will hardly send any of the fans response to NoJ and even if they do they probably misunderstand most of it. Barely anybody owns a Wii U or consoles in general in Japan so they won't get much responses there. You know the rest. People play 1v1 in smash!!!?? What pointless waste of time given the inbuilt purpose of this game. Nintendo don't have the technical know how, infrastructure or horsepower to provide gamers with what they want when it comes to online. The Wii U online isn't even on par with mid 90s Pc gaming for goodness sake. My moto with Nintendo is expect great, highly polished offline gaming experiences but be prepared for terrible, creaky OS design, Tiger electronic like hardware and pathetic online. @DESS-M-8 that explains 200k + viewers for melee grand finals at EVO and over 90k viewers for smash 4 right? The game serves a dual purpose much like other fighting games. You can play them casually for fun or competitively. Feels like Nintendo's trying to get ready to abandon local multiplayer...it just FEELS like it. Well its OK it could be better like give us the option to do 1v1 custom tourneys in community tourneys reduce wait time 10 min max and increase match time to 6 minutes like normal for glory those are the only issues I found annoying. It needs a 1v1 best of three knockout option and a bigger cap for players in regular tournaments 100 is too low. This is almost as bad as not allowing single races in Mario Kart 7. I'm nust glad Miis are allowed unlike in For Glory. @Wolfgabe It's quite a reasonable reason to hate it if you ask me. I feel the same way, even tho' I don't ''hate'' it, but it's annoying I can give him that. Is there an option for co-op tournaments, like playing with a friend against two opponents over Nintendo Network? Because that's what I'm missing. Their online is so much behind their competitors so they won't be abandoning local play anytime soon, otherwise, Nintendo is doooooomed! Came way too late, already lost interest in Smash. I want a classic-classic mode, and a adventure mode. I have no desire to play single player with how bare bones the experience is. For Glory 1 vs 1 is the only option for some. I have no one to play locally with and I noticed the lag is awful when there are more than two players fighting at once online. I would like to see an amiibo tournament option. Aside from being a great collectible, I have way too many of these sitting around collecting dust. I still haven't seen a game use them in a way that makes them a needed thing. Splatoon was probably the closest. I really wish there were local tourneys. I loved the brackets in Melee and Brawl, 'twas a blast to play them. I also wish the 1v1 matches were best of three. I waited nearly 30 minutes for a tourney and got defeated in one round. Sure I could get better at the game, but still. Having no local tourneys or 1v1 tourney options is downright pathetic. Screwing up matchmaking algorithms also shows off Nintendo's amateurish experience level with regulating a competitive fighting game. (Not to mention 1v1 would alleviate the matchmaker droughts.) Melee and Brawl included the tournament feature in some fashion, and Project M certainly didn't skimp. It feels like Smash 4 is not as fully featured as Brawl and Project M, and we can't necessarily rely on Nintendo patching in the missing spots, with their online inexperience. Hopefully, they will learn from this. @DESS-M-8 1v1 can alleviate times when FFA or 2v2 matches are difficult to find. It takes a lot less time to evenly match up less players per match than more. That's basic online matchmaking knowledge. @AVahne Considering local multiplayer is one area Nintendo truly excels at (and has done so for decades), that would be a catastrophic mistake to give up their traditional bread and butter. The internet is a great convenience, but there's still something to be said for local hookups in person, that cannot be replicated in an online environment. The whole thing seems pretty pointless without a local mode, to be frank and straight to the point. In its current state, not really sure who the target audience actually is for this feature.